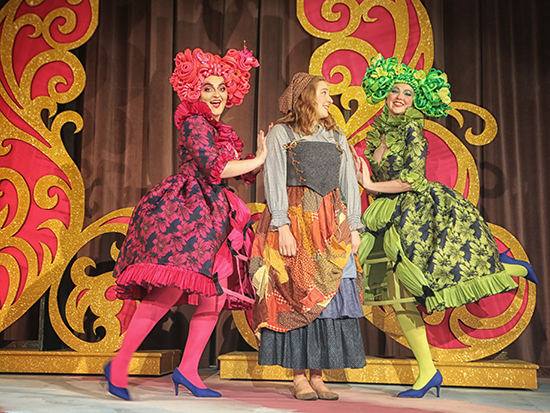 Evil stepsisters (Hallie Schmidt and Sabrina Brush) vex Cinderella (Tessa McQueen) in OCU's opening opera of 2019. A cast of 33 singers and a 46-member orchestra will present a “zany and enchanting” interpretation of the Cinderella fairytale in Oklahoma City University’s first opera of 2019: Jules Massenet’s “Cendrillon,” Feb. 22 to 24. The French romantic comedy will be performed in English on OCU’s historic Kirkpatrick stage in three performances at 8 p.m. Friday and Saturday and 3 p.m. Sunday. Tickets (ranging from $14 to 28) are available from 405-208-5227 or www.okcu.edu/tickets. OCU’s 120th anniversary performance will feature imaginative lighting and sets and custom-made costumes, creating a colorful cast of characters inhabiting a royal palace and an enchanted forest. Matthew Mailman will conduct the Oklahoma Opera and Music Theater Company Orchestra. The production features scenic design by professor Jason Foreman and prop design by professor Lawrence Heyman. Lighting design is by Marina Oakley and original costumes are by Celia Kasberg, seniors in the School of Theatre’s design and production program. OCU’s Oklahoma Opera and Music Theater Company, the nation’s longest-running collegiate-based opera and music theater company, has won seven National Opera Association awards in the past six years. The school was named to Playbill's 2018-19 list of top 10 collegiate training grounds for Broadway performers.